Rep. Price toured Northwest Texas Hospital’s labor and delivery unit and took time to meet with patients, hospital administration, OBGYN physicians and nursing staff. “In rural communities across the Panhandle and other parts of our state, CRNAs and the men and women at Northwest Texas Hospital are working hard to ensure patient access to highquality care wherever they may live. 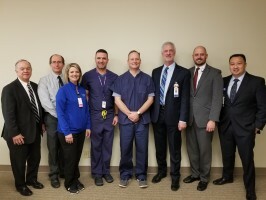 We were pleased to have the opportunity to welcome Rep. Price today during our CRNA Week activities,” said Gregory Collins, MSNA, CRNA and TxANA Board Member.